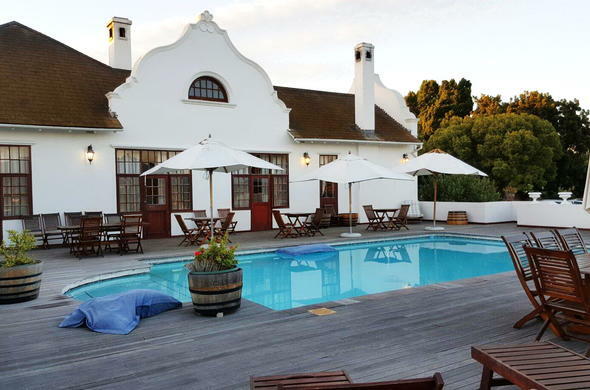 Excelsior Wine Estate & Manor Guesthouse offers luxury Victorian wine farm accommodation and high quality red and white wines near the town of Robertson. Perfecting the creation of fine wines for over 300 years, Excelsior Wine Estate in the Breede River Valley is a wonderful getaway near Robertson. This enormous farmhouse reflects the affluence of a bygone era and has been fully restored. Through the decades this Breede River Valley wine estate has cultivated wines and also bred ostriches and horses. All the suites in the manor are named after horses bred on the estate. Owned by the same family for generations, Excelsior Manor Guesthouse out as a “feather palace” during the Ostrich feather boom time of the early 1900's. The elaborate architecture and sheer size of the farmhouse is a reflection of the opulence of the Cape Revival era. Excelsior Manor has extensive mature gardens and a delightfully fragrant rose labyrinth. The bright blue pool is surrounded by a wooden deck which is just the place for views of the Langeberg Mountains and beautiful sunsets. On the wine estate, guests can bottle their own wine and learn about winemaking in an exclusive cellar tour followed by wine tasting. Gentle activities to be enjoyed on the estate include birding, walking and fishing. Other options are exploring Robertson and neighbouring towns. There are nature and game reserves, golf courses and many other wine estates to discover in this region.